When Eddie Miller decided to buy a Z in 1976 he wanted to learn more about the cars and get first-hand experience of how they drove before he bought one. Unfortunately, he discovered that no owner’s club for the Z existed. Undaunted and driven by the appeal of Zs, he took the plunge and purchased his car. At the garage where he bought it, a very enthusiastic mechanic introduced him to other 2 owners. With this nucleus of Z owners and their valiant effort, the Z Club grew from an idea into reality. 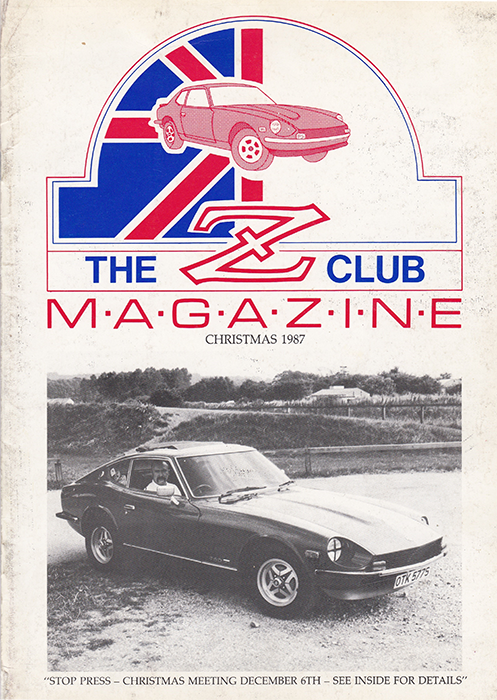 They had several meetings to get the show on the road and it was decided to spread the word to other Z owners that a Club was going to be formed: If they wished to be part of the Club all were to turn up at Eddie’s house for a formation meeting. It was a dry, cold, crisp day in February in Eddie’s cul-de-sac. The cars received an enthusiastic reception both from the owners and Eddie’s neighbours who couldn’t resist the temptation to come out and look at them! 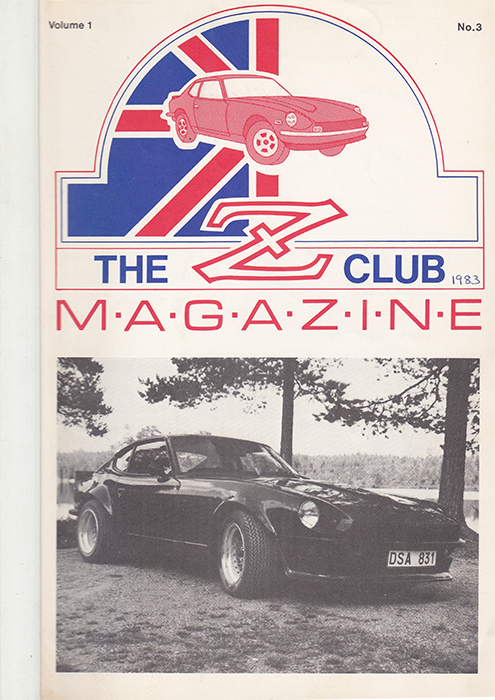 Following the formation meeting it was decided to advertise the first ‘official’ meet of the Z Club in national car magazines. With complete surprise and delight that thirty-five cars turned up, and the Z Club was born. 1977 – This year sees the club establish itself with Eddie Miller at the helm and the newsletters start to roll out inviting all enthusiasts to join in the fun – mainly centred on the south of the country. 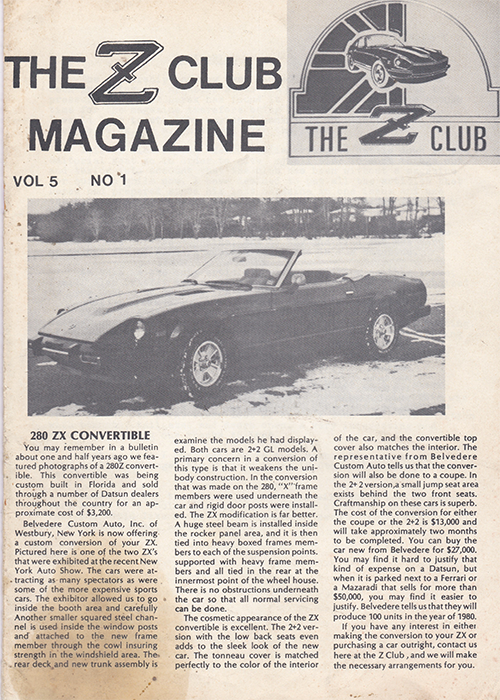 The first Z Club Magazine is produced. A stapled A5 sized booklet in black and white on plain paper. 1979 – Big issue of this year includes the escalating costs of hiring venues for club events, the introduction of Denovo tyres on 280ZXs, Glen Campbell (country singer) shown advertising a 280ZX fitted with Denovo’s with the cheesy slogan “From Zee To Tee” as he travels to his golf match. 1980 – The meeting held in this year regularly attracted 25+Z’s each time! The AA’s guide “How to valet your Z properly for the princely sum of £42 appeared in the late summer issue of the magazine. 1981 – Paul Newman cuts a dash in his 280ZX, when he finishes 2nd in a field of 29 entries at the Golden State Raceway. Racing was his hobby and the Datsun was his choice and was not a bad advertisement for the marque.- Lynne Godber’s ‘Zep’ makes his first appearance. 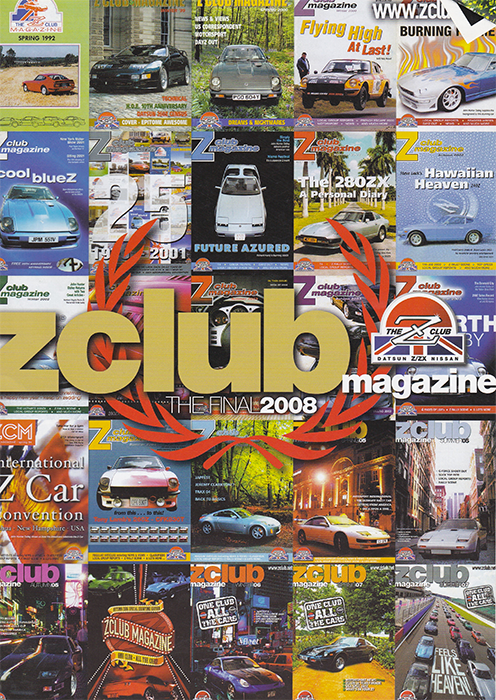 The Z Club Magazine switches to A4 format. 1982 – You could pick up a 1971 240Z for a mere £1200 – Classic valuations rear their head – Lyne Godber becomes Chairman – Richard Waterman becomes editor – Membership fee is £10 per annum. The magazine switches to a white binder instead of stapling. 1983 – The club accounts were printed for the first time – Zs goes racing at Thuxton – Club shop is set up, Key rings are a bargain at 35p, and not forgetting the pens at 25p. 1984 – Production of ‘Z’ series reaches 1 million – 300ZX’ (Z31)’ launched in the UK -The price of the ‘Z’ appreciates, concours 240Zs available for £2000 – Mike Feeney takes over as spare parts collator – by the end of the year membership reaches 250. 1985 – Foreign Z clubs extend the hand of friendship to members with invitations to meetings – Big Sam for sale – John Bowker becomes editor – Membership stands at 480. 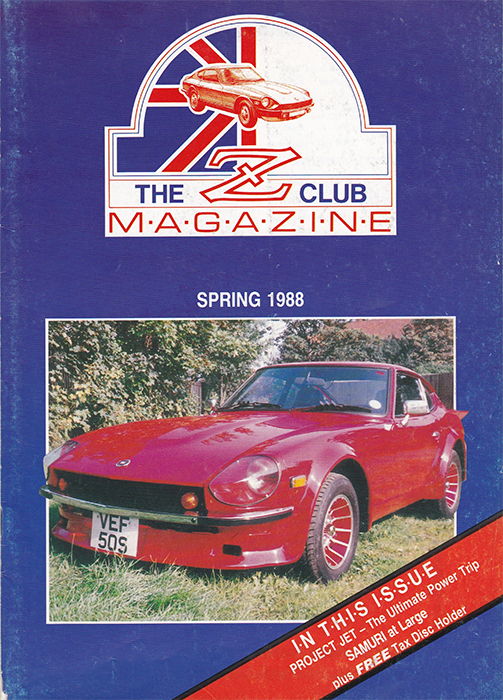 1986 – Parts Department expands to a size were it needs its own bank account – 2nd European International meeting hosted by the Z Club – 240Zs hold their price at £2000 – Membership increases to 570 – membership fees increase to £12. 1987 – Anniversary celebrations – First Goodwood Track day, FREE to all club members as a birthday gift – Lynne Godber resigns as chairman and is made honouree member – Margaret Bukowska takes over as Chairman. In winter the magazine is still produced in black and white but is now printed professionally on a glossy paper. 1988 – The club becomes VAT registered – First Kaminari cars (PAD 500W, now owned by Steve Burns, SPO 220 & TCR 991) make an appearance in the UK. – The parts department makes credit card payments available – John Bowker becomes Chairman. – Membership reaches 710. The first colour magazine is produced. 1990 – International Z scene becomes more prominent with contact established with clubs from Australia & America. – Club starts the first World Z Club Directory. – Members convoy to the Dutch International Z meeting. – Members involved with Popular Classics Magazine article. – Club is involved with dealer’s Z32 launch. – Blip in production means the Christmas magazine reverts back to black and white. – Steve Burns takes over as editor. 1991 – Magazine bounces back into colour with the Spring issue. – Prices for Zs rising to £3000 -£5000. – International Z meeting held in the UK. – Our American Correspondent, John Hunter Dailey, makes his debut. 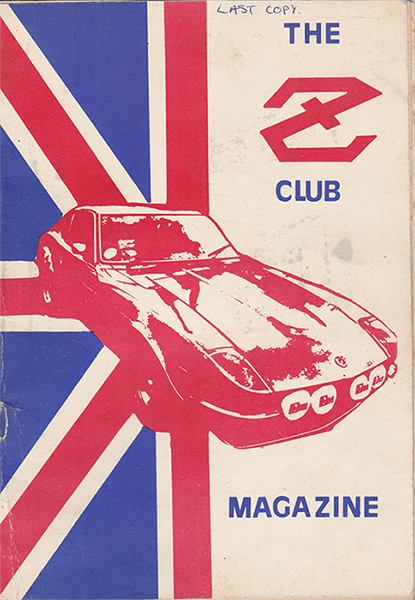 – Magazine placed 5th in Car & Car Conversion’s Best British Car Club Magazine competition. – Members convoy to the Swiss International Z meeting and win Best of Show. – Sean Dezart becomes chairman. 1992 – The club hosts the first Japanese Classic Sports Car Weekend at Goodwood, the forerunner of the Japanese Auto Extravaganza. – Members visit the German International Z Meeting and Le Mans. – Original 240ZG found in the UK. – Mike Feeney wins the National PRO-ET drag racing championship for the 2nd year running. -Kevin Bristow & James Morris win Post Historic Rally Title. 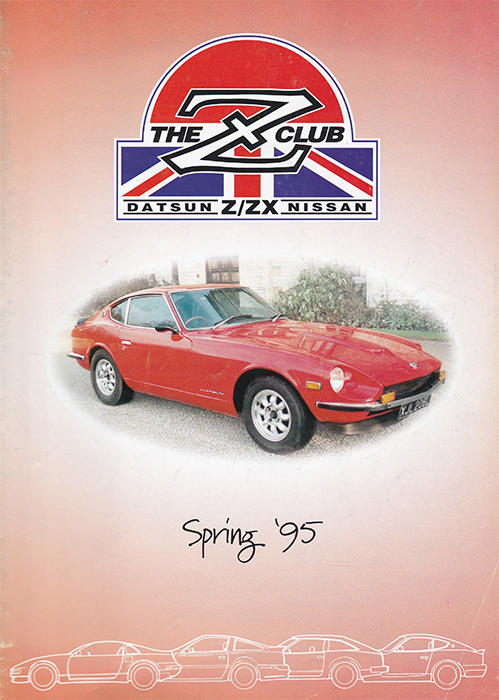 1993 – Nissan invite The Z Club to their open day for the first time, 20cars attend from the Z/ZX range. The Club’s logo is changed to reflect its commitment to both the Datsun Z and Nissan ZX cars. Wins an award for The Best Club Event in the 750/2500membership class for last year’s Japanese Classic Sports Car Day. – Membership falls to 750, due to economic climate.- Members feature in Your Classic car magazine. – members attend the Z Car Convention held in St Louis. – 2nd Japanese Classic Sports Car Day is held at Aintree Race Circuit and is again hosted by The Z Club. John Foreman becomes Chairman. 1994 – A sad year for the Club with the news of the death of Tina Potter who designed the Lazy Dayz and Legend Lives On tee shirts. A sad loss to all. – On a brighter note the club won a further award, the Classic Car Magazine Enterprise Award1993. – 25th birthday of the Z Car, the club celebrates at Nissan Motorsports (Europe) Ltd headquarters at Didcot. – The Z Club is the only Japanese Car Club invited to take part in the Int. Motor Show Cavalcade through Birmingham town centre and provides seven cars across the range – Alan Davies launches the 300ZX Register. – The Z Club hosts a five day European Z Convention incorporating the Japanese Auto Extravaganza. – National points system developed to help to find the most active member a prize of a years free membership for winner. – Steve Burns becomes Chairman and Mark Atkins becomes Editor. 1995 – Twin Turbo no longer to be imported to the UK. – Members travel to the Dutch International Z meeting. – Club helps find garage for three Zs taking part in the London to Mexico rally and one finishes 2nd. – Members visit the USA Z Convention. 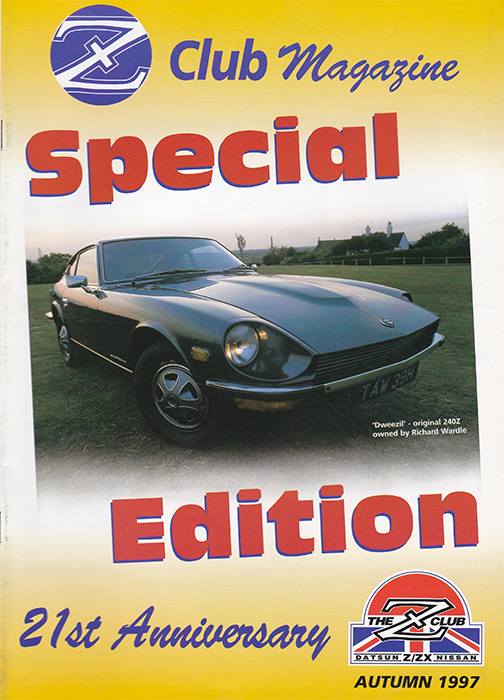 – Member Colin Shipway has his book Essential Datsun Z published. – the debate on whether 200SXs should be included in the club begins. – Membership falls to 700. – The club again hosts the Japanese Auto Extravaganza. – Members visit the German Z Club. – John Forman becomes Chairman again. The club magazine gets a new cover style. 1997 – The Club celebrates its 21st anniversary and holds a track day at Goodwood as part of its celebrations. – The Club returns to the Classic Car Show at the NEC. – The 6th Japanese Auto Extravaganza is sponsored for the first time by a private company and d 12 car clubs attend, It is now established as The Japanese Car event on the car show calendar. – Samuri Register is formed within the Club by Dave Porter in a bid to register the surviving Sams . – The Scottish Z local group celebrate their 10th Anniversary. 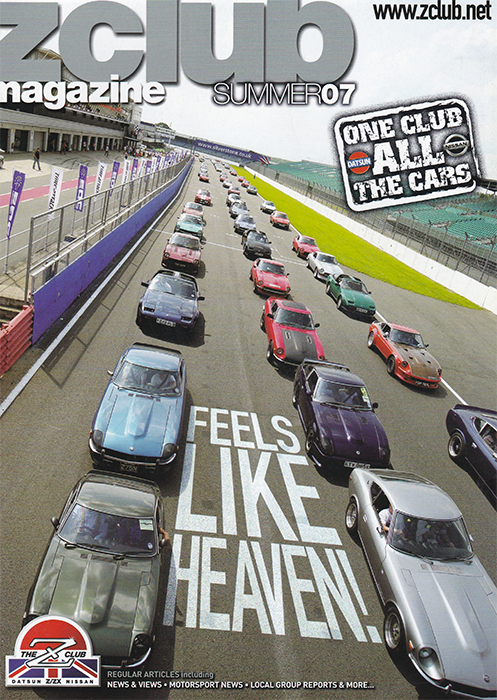 – The Club’s magazine finishes runner up in its class in the 1997 Best Club Magazine Awards run by Classic Car Magazine and receives a Highly Commended Certificate. To celebrate the anniversary a Special Edition magazine was produced with memories from all the club’s previous chairmen. Club takes part at Traxx ’98 at Silverstone and Roy Say’s 240Z win concours runners up award. 1999 – Photos of the Club’s stand at the Ally Pally Classic Car Show appear in “Classic Car Weekly” and “Practical Classics”. – A Club member imports a 240Z from California and finds a black widow spider under the wing. – Gill Hall takes over as Chairman. – Membership rises to 598. – Members travel to a Dutch Z Club meeting. – A member has his car filmed for inclusion in a Japanese TV documentary. – The Heart of England local group celebrates its 10th anniversary. – A member’s 260Z is filmed by Ulster Television for use in a documentary. – 8th Japanese Auto Extravaganza gets even bigger with more Japanese car clubs attending. 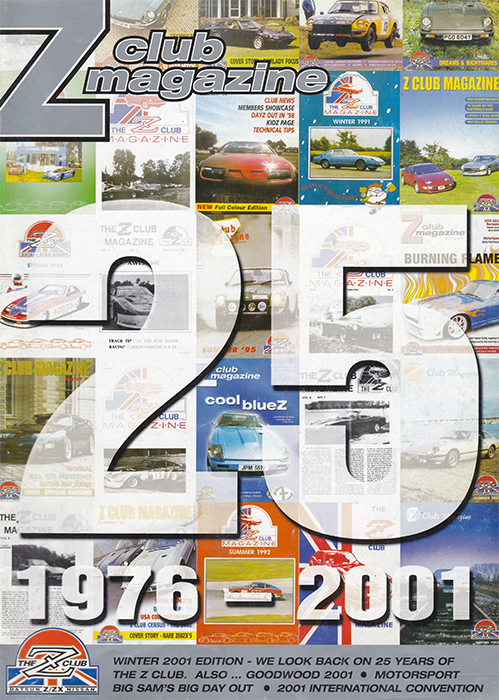 2000 – The motoring press exceed our expectations over the year with the amount of coverage on members and their Zs, “Banzai” feature John Shaw’s 300ZXTT, Nico Manget’s Samuri is featured in “Classics”, “Japanese Performance” cover Jullien Penn’s 300ZXTT, Steve Bicknell’s 240Z is featured and is the cover photo for “Practical Classics”. – Malcolm Yule was featured with his Samuri on Scottish Television and 12 members and their Z/ZXS were featured on Carlton TV’s “Pulling Power”. – Len Welch’s 240Z wins 2nd place in the Concours d’Elegance at the Ally Pally Classic Car Show. – A 240Z is stolen during the night at the 9th Japanese Auto Extravaganza at which the Club used a professional concours judge for the first time with the award going to Roy Say’s 240Z. – Members visit Z Conventions in Holland and Las Vegas. Membership increases to 640. 2001 – The Club has it’s 25th anniversary and has a track day at Goodwood as part of its celebrations. – The Club’s magazine wins first place overall in the “Most Improved Club Magazine” at the NEC Classic Car Show. – Big Sam, driven by Win Percy, makes a return to the track at Silverstone and finishes 4th in a field that includes a Ferrari 355, a GT40, V8 Morgans and MGB V8s. – Members visit the newly formed French Z Club. – The H.O.E., Cheshire Plainzs and the North Coast to Coast local groups join forces at the Tatton Park Classic Car Show and walk away with the best club stand award. – Len Welch’s 240Z and Steve Hodgson’s 280ZX are featured in “Practical Classics” magazine. – Geoff Gale takes over as Chairman. Another special magazine celebrating the Clubs 25th birthday was produced. 2002 – 29th January saw the launch of the Z Clubs website www.zclub.net. The Clubs Drag Challenge has 4 rounds all at Santapod and at the final round Mark Watkins persuaded Viki Butler-Henderson to do a piece on Ratz 280ZX. Club has a stand sat the NEC Classic car show. A new arrival appeared at Tatton Park show when ex chairperson Gill Hall and Mark brought their new arrival along. Andy Turner of Mr Z-ACT Engineering retires. Mike Feeney and Roy Say star in an “Esquire” magazine photo shoot and Malcolm Yule’s 300ZX & Samuri feature in a 6 page article in “Japanese Performance Magazine” Kathleen Yule takes over as editor from Mandy Heathcote. The magazine covers the Silverstone event. Later 2008 the Club did manage to produce an digital magazine that was also available on CD but it was found to be an almighty task to continue this and sadly no more were ever produced.